We recently had an opportunity to go out with some friends from college (see their story here). With their only request being “Italian,” we decided to forgo the Little Italy staples, and after a little research from S, ended up at Bruno’s Ristorante, a cozy little joint on the near-West side. Bruno’s bills itself as “the best kept secret in Cleveland,” and it’s hard to argue. It’s not near any other commercial or dining enterprises, and frankly, in a neighborhood that’s a little less than savory. But don’t let the surroundings deter you. Bruno’s is a well-kept secret, but definitely one worth discovering. I said cozy, and I meant cozy. The dining room is not large, and the tables are close enough together that, if I were so inclined, I could have reached out and touched someone. Many someones, actually. It’s not spacious, but the close quarters didn’t detract in any way from the experience. In some ways, I like restaurants like this. No, you probably won’t have deeply personal conversations, but it’s not as seemingly sterile and industrial as some places can be. Just a good neighborhood spot that’s clearly doing something right, because it’s full of locals and repeat customers. We were started with bread, a nice toasty ciabatta served with garlic butter. S also found a coupon for a free appetizer, so the table split an order of sausage-stuffed banana peppers. Just a little bit of zing – enough to make your nose run, but not so much that you’re crying. With most entrees, you have the choice of soup or salad, and we both tried the Italian wedding. Good flavor to this one, and filled with greens, little meatballs, and star-shaped pasta. The dinner menu has most of your typical Italian fare – lots of pastas (all homemade), chicken, veal, and pizza. S chose the Pollo Romano, a Romano-encrusted chicken breast topped with a light pesto cream sauce. I didn’t get to try any, but it looked good, and she said it was good, so I’ll trust her judgment. 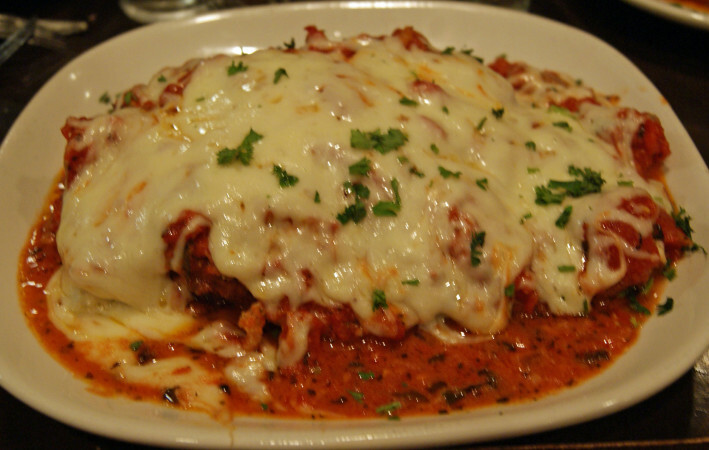 For my dinner, I selected the Pollo Sicilian, which is essentially a chicken Parmesan with eggplant Parmesan on top, except with provolone. (Did I mention that the portions are HUGE? I ate what I could here, and still brought enough home to make TWO more meals. And I can usually hang with the best of them when it comes to eating.) My only complaint was that I either had a bad piece of chicken, or it was overcooked. A lot of the meat was very tough, almost like cartilage. Kind of disappointing, because the rest was fantastic. (S also had chicken, and hers was fine, so I’m just assuming it was an inferior piece) Very cheesy, and the sauce was nice and chunky, if you like your sauce that way. And on top of the giant portions, each dish came with a side of pasta too, which, being homemade, was much better than the standard spaghetti at most restaurants. Doesn't look like much, but underneath all that cheese and sauce are chicken and eggplant. 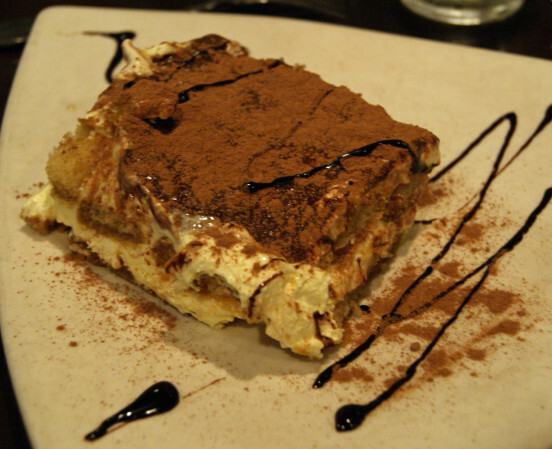 Finally, for dessert, we split a tiramisu, which was creamy and not too strongly coffee-flavored. Fittingly, it was also huge. And I did manage to find enough room to finish it. Final verdict: Bruno’s gets five-and-a-half stars out of seven. The food is simple but excellent, prices are very reasonable, especially given the amount of food (almost everything comes in under $20), and service was perfectly fine. All in all, a satisfying, filling, and very Italian meal. This place is amazing and one of my favorites. Their lasagna is OUT OF THIS WORLD! Abbey, Ben got the lasagna, supposedly the “best in Cleveland”. He challenged us to get something on the menu marked “best in Cleveland” and stand up and announce “You did it! Congratulations!” like in Elf. Hmm, I don’t recall Ben living up to the challenge though. Maybe we need to revisit Bruno’s. And I agree, this was a great restaurant! Another one checked off the A-List we’re attempting to conquer.